Carter's Onesies as Low as $1.56!! Carter's is offering 70% off of most their multipack onesies. 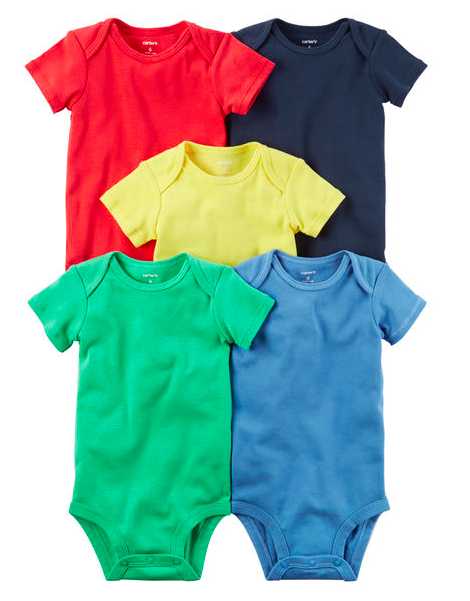 A bunch of their adorable 5-packs are only $7.80 (reg $26.00), which means you can get your little one a onesie for $1.56!! These make perfect, easy outfits for your baby during the summer with a cute pair of shorts. They are also such a great idea for baby shower gifts. Free shipping is offered by Carter's when you spend %50+. They do offer free in-store returns if you want to over order and return what you won't use. See our favorites below.